Today (and by today I mean last Saturday, when I started writing this) I went to the Royal Hospital at Chelsea to see the Elephant Parade elephants gathered together for one last time. It was a bittersweet moment- a chance to revisit the elephants that had practically become my friends, tinged with the knowledge that we would now have to go our separate ways. My elephant journey began not through any official announcement of the parade, but rather a random and seemingly inconsequential pattern of events. First, a friend ‘liked’ the Elephant Parade page on Facebook, but even then the significance of what he had uncovered didn’t strike me until I began spotting the creatures on my travels through London. After spotting a few during trips to the South Bank and the Chelsea Flower Show, I knew I could do no less than start photographing them, and learning that there were 258 of the creatures dotted about didn’t deter me at all- I might have come late to the party, but I was going to do the Pokemon thing and catch them all. Although I managed to see an elephant here and there on that first weekend, it was only on the Spring Bank Holiday that things really kicked off. Despite my good intentions to go into the office to do a extra day’s work (before you go getting any ideas, it was to make up for a day off I had had some weeks previously), the general emptiness of the office and the pleasant weather outside naturally conspired to make me want to venture away from my desk. So it was that just after half an hour, I took myself and a printed map of the elephants’ locations and struck out for my first destination- Hyde Park. That first day, whilst both fun and exhausting, had many lessons to teach, some of which I wouldn’t appreciate until it was too late. As I walked from Hyde Park to Marble Arch and then all the way along to Trafalgar Square before taking the tube to Green Park and working my way back to Covent Garden, the need for extensive planning began to become apparent. As long as undiscovered elephants remained plentiful, it was possible to stumble across many just by walking round Central London, but once the main clusters were ticked off, it became necessary to plan each campaign with military precision. By the end, I would leave work armed with Google maps and a detailed plan of attack, and even then it was possible to get things terribly wrong. Take Brixton, for example, where I misremembered what I’d read on the Facebook page and stupidly walked in the wrong direction for twenty minutes before using the GPS on my phone to realise I was in completely the wrong place. Or my first attempt to find the Hempel Hotel- I walked right past it without realising that the hotel entrance was labelled with a modest ‘H’ rather than the hotel’s full name. There were times when the frustration would almost become too great- but then you’d round another corner and there they’d be, and the feelings of triumph and victory would wash away all traces of your earlier struggle. With every free evening and weekend dedicated to the task of tracking down the scattered herd, routines had to change- and it was just as well that the long days of summer afforded just enough daylight hours to complete the search. Whether it was trekking from Tower Hill to City Hall, reaching Berkeley Square just before dark or fervently hoping that Victoria Tower Gardens didn’t close early, there was certainly no time for normal living. Cooking, cleaning, socialising- none of these things mattered anymore, unless they could be done as quickly as possible en route to another batch of elephants. Trickier still were the elephants who were located indoors, where limited opening times made them hard to get to after hours. After having to withdraw from Selfridges because it was too packed and getting kicked out of Hamleys mere feet from the elephants because it was closing time, perseverance and timing paid off. Even the legendary House of St Barnabas fell to the power persistence- after hearing stories of how people had been rudely turned away, I nervously dressed in my finest clothes and put on my politest manner, only to receive such a warm and friendly welcome that one of the staff members almost sent me into a room where club members were having a private breakfast! 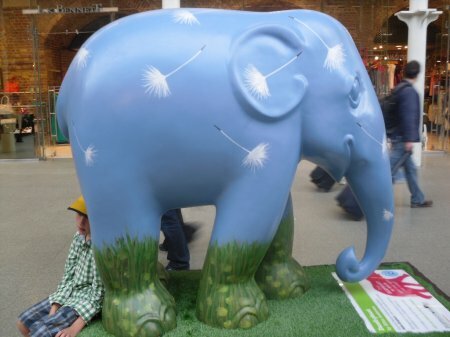 And thanks to the kindness of the people at Elephant Family HQ, I even got to meet the infamous Gerald, who was dismissed from Selfridges after close inspection revealed that the ‘leaves’ decorating his lower half were actually images of genitalia. In fact, although there were surely plenty of people who thought I was mad- such as the lady at 81 Fulham Road who must have thought I was some kind of idiot by the time I understood that she was directing me through a door that I thought was locked- everyone from security guards to complete randomers seemed to understand and appreciate the quest that I, like so many others, had chosen to undertake. Of course, that didn’t mean the photography always went smoothly- at Covent Garden I had to wait for a crowd to disperse before I could get any kind of shot of the Clonakilty Irish Elephant, whilst Frank at Market Place was surrounded by a party of people drinking cocktails. At my second of three visits to the Hempel, access to Chestnut was denied due to a private party in his garden, with my attempts to get a distance shot distinctly hampered by thick hedges. After a few failed attempts made me look more like a crazy and indiscriminate stalker than anything else, I had to give up and return the next day. Although the task of seeing all 258 elephants in their various locations had seemed a tall order at first, through a supreme effort the finishing line was in sight well before the day when they would be taken from the streets and gathered together as a herd. With just nine ‘problem elephants’ left to find, I went as far as taking a morning off work to get to the ones only available in the mornings or during office hours, thinking this last stretch would take an hour or two at most. Finally, by lunchtime I had made the rounds of the Royal Exchange (which I then realised was open until late, even if the shops themselves weren’t), the aforementioned House of St Barnabas, the Hempel (for the third time, to get close to Chestnut), Somerset House and Devonshire Square and the list was complete- at least, until a couple of secret extra elephants were released at the RHC (Glastonbury’s Glaston-Elly was always destined to be beyond my reach). Victory had been achieved, but it was a victory tinged with sadness- this was the end, and I could have my normal life back, but a very special era was undoubtedly over. No longer would this scavenger hunt across London dominate my life, leading me to revisit favourite places and discover new ones, to chat about progress to like-minded people on Facebook or cross their paths as they undertook their own elephant quests. But fear not, dear friends, for the journey doesn’t have to end- this summer there are lions in Bath, rhinos in Chester, dragons in Newport and toads in Hull! Visiting them all might be a bit much for my time and budget, but I plan to see what I can do. See you there, perhaps…? If you enjoyed this post, check out my photos on Facebook and sign the petition to support the future of the Asian Elephant (even if you’re cynical about petitions, surely it’s worth a shot).